While history is so often about major events, the details of everyday lives are equally important in creating a portrait of a place and time – and it’s those details that are celebrated in a new book all about Tardebigge in the 20th century. A Hundred Years in Tardebigge came into being when the Rev Alan White decided to create a sequel to Margaret Dickins’ A Thousand Years in Tardebigge, written in 1928. Rev White is particularly well-placed to take up the mantle of Tardebigge historian – he was priest-in-charge of the parish between 1989 and 2000 and continues to serve as an honorary assistant priest, and has also published four other local history books. A Hundred Years in Tardebigge is efficiently divided into sections exploring the different areas of the parish, including Webheath and Foxlydiate which once fell within the parish boundary, as well as mini-communities such as Hewell Grange and Tardebigge School. There’s also a section on the Worcester & Birmingham Canal – the author has previously penned an entire book on that subject, so he knows his stuff. Clearly there is a lot of ground to cover in a whole century of history, but by concentrating on very local events and characters, the book shows the parish as a microcosm of life in Britain, or at least its rural parts. Illustrated throughout with photos, many borrowed from residents’ collections, A Hundred Years in Tardebigge introduces the reader to important figures and families of the parish, from vicars and headteachers to lords and ladies of the manor and the female “Squire” of Bentley, as well as telling the stories of well-known buildings such as Hewell Grange and Tardebigge Village Hall (now The Tardebigge pub). Local records have been meticulously researched in order to provide the detail that makes the book so interesting, but the most fascinating bits are the memories of local people, most having grown up in the parish in the first half of the century – this really brings home how much life has changed. Yet in some ways, things aren’t so different – the area has retained its country feel, with farming still an important part of Tardebigge life, and the sense of community is clearly still very much alive as the parish moves into the 21st century. One of the “voices” in the book is that of Marion Tongue, who worked as a housemaid at Hewell Grange from 1930–38, when Ivor Miles, second Earl of Plymouth, was in charge. We’ve printed an excerpt from her story, which offers a fascinating glimpse into the minutiae of life at “the big house”. “Hewell Grange was a little town all on its own. As well as the housekeeper, Mrs Gates, and housemaids, there was the butler, two footmen, the cook, three kitchen maids, a daily woman, three odd-job men and four laundry maids. I don’t know how many gardeners there were; I know there were three in the kitchen gardens, which were a long way off from the house. The gardeners used to grow all the food for the family’s house in Hyde Park in London; they sent it every day by rail. We had nurses and nursery maids and governesses and a schoolroom maid. 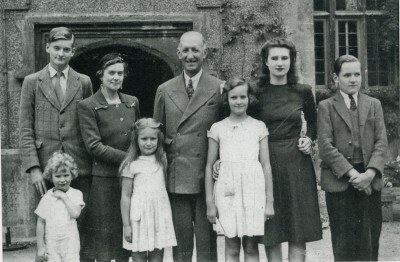 The Earl and Countess of Plymouth had six children (pictured above). They used the same pram that the Countess had when she was a baby. The gentry never throw anything out. We used to have to be downstairs at half-past six. That meant half-past six and not 25 minutes to seven. It could be a bit earlier but never a minute later. They were all very punctual as regards time. My first job was lighting fires, first was the housekeeper’s room, the second was the business room and the third was the dining room. The family often had guests staying overnight, and a seven we had to call the gentry with a cup of tea if they hadn’t got a ladies’ maid. We used to have to go to the butler’s to get the tray, then go to the kitchen for the water for the tea. Sometimes the footmen would carry the tray upstairs for us but, of course, they were busy first thing in the morning. We used to have important guests; Anthony Eden stayed there and the Prime Minister, Stanley Baldwin. At eight o’clock there would be breakfast, then from twelve to one o’clock was our lunch. We always had our own meal before the gentry, we never had what was left. Ours was cooked specially for us and there was always ample. At a quarter past one the gentry had lunch and as soon as they went into the dining room we used to go to the drawing room and fluff up the cushions and tidy up. We finished work at two o’clock and had two hours off until four o’clock. Often we had to put water in each room in a can and put a towel over it, for the gentry to wash their hands before they went downstairs. The dinner was at about a quarter to eight. We would go and look round the bedrooms to see they were all right, turn the beds down and put the hot water bottles in. Then we finished for the day. We would be in bed long before ten o’clock. We had a half day off each week, which started at two o’clock. On my half day I would sometimes go home. From October to February the shooting season was on; there were shooting parties and we were much too busy to have our half days. We never had them made up. We forgot about the outside world, we were so happily engaged with our work. Her Ladyship was very good-looking, tall and smart. We didn’t see much of his Lordship. He was the Under Secretary for Foreign Affairs, and he was often in London. They were a very nice family. If any of the village people were ill, food used to be sent to them. His Lordship and her Ladyship didn’t give money, they gave presents. I remember when the butler had a cruet and the housemaids had brooches. At Christmas there were such a lot of us for presents that we had to queue up in the linen room in a long line. His Lordship would hand the present to her Ladyship and she would give it. I remember I once had an umbrella and another time I had a nice nightdress with lace on the top. I loved every inch of Hewell Grange. It was a beautiful place. There was a notice in the house telling you how long it had taken to build – seven years. A Hundred Years in Tardebigge is published by Brewin Books and is available in local bookshops and on Amazon, priced £14.95.